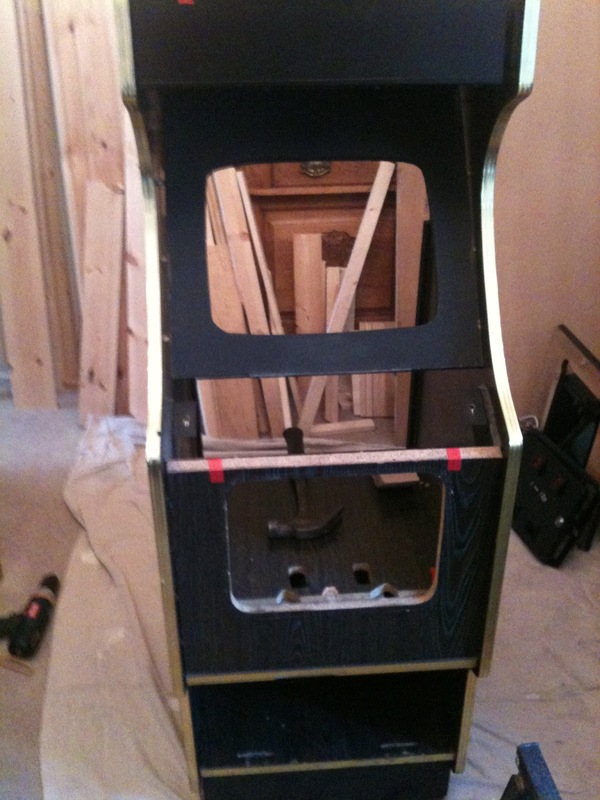 Vec-Cab: The cabinet is here! Finally the cabinet has been delivered and oh boy what a sorry state it is in. Ok maybe I am being too dramatic and the cabinet is not that bad considering the £40 I paid for it. But as you can see from the photo it’s just the bare bones. There is no marquee, only a piece of black plastic. The sides are scratched and chipped at the edges. The gold t-mold strip on the edges are chipped in several places. One area looks to have even been melted from a cigarette. The wooden kick box on the base of the cabinet appears to be warped due to water damage and needs to be completely replaced. On the plus side, the cabinet did come with a working twin coin insert mechanism, a twin joystick and button control panel, a JAMMA power supply, an assortment of buttons and joysticks. Also supplied was a wooden panel door for the back and the opening reveals plenty of space for the monitor and electronics. Initial thoughts so far, are that there is far too much space in the cabinet and putting a Vectrex in there with its 5” x 8” monitor will look just plain ridiculous. Apart from that I’ve got an underlying cabinet structure that should form the basis of the VecCab.